In response to my post on Timbuktu, reader PG proposed the following question, one that is as astute as it is intriguing. I’ve always wondered about something and never seen it addressed in the scholarly work (e.g. by Glenn Reynolds, John Lott et al) that I’ve read about the 2nd Amendment and firearms, so I hope you can provide a useful perspective. When I think about instances of serious governmental overreach within living memory in the U.S. — something where I think the word “tyranny” is not a total exaggeration — the biggest one that comes to mind is not something like Ruby Ridge or Waco, where the government was just trying to regulate firearms themselves. Instead, I think about the mass internment of West Coast Japanese-Americans after Pearl Harbor, when the actual bodily liberty of over 100,000 people, most of whom were U.S. citizens, was taken away by the government’s herding them into camps. Do you think it would be the correct course of action for citizens, when faced with such a threat by the government, to respond by utilizing their 2nd Amendment rights to defend themselves? If so, how do you think that would have worked out for Japanese-Americans as a response to the government’s demand that they go into the camps? Which brings us to PG’s question and what it means for the gun control debate. Generally speaking, there are three bases on which advocates of the right to bear arms rest their case—practical, historical, and philosophical. Practically speaking, guns are necessary for self-defense in the modern world, as well as for many recreational activities like hunting and sport shooting. 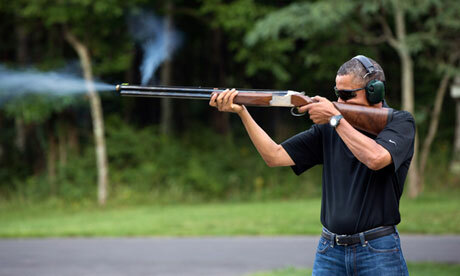 After all, even the President shoots clays on occasion. The philosophical grounds is more metaphysical but no less important. Having the right to bear arms is, in many ways, the ultimate right. It is action in a way that voting or speech is not, and it makes a mockery of the notion that the government has a monopoly on force. It is power, the kind ordinary citizens have not held during 99% of human history. PG’s question goes to the historical basis. It’s the Timbuktu case. We need guns to defend ourselves from tyranny. But what does the Japanese question say about the viability of that argument? I think PG knows—and I think most people would agree—that it would have been an unmitigated tragedy if the Japanese had resisted internment. At that time in our nation’s history, in the shadow of Pearl Harbor, it’s hard to imagine the death and destruction that could have resulted from resistance. In many ways, an armed rebellion would have served to confirm in the minds of the architects of internment the need for their policy. To put it simply, if the Japanese had resisted, they would have been slaughtered. What is the lesson to be drawn from that conclusion? It’s not that the Japanese were not within their rights to take up arms against the state. They might very well have had the high moral ground given the circumstances. Rather, it’s that in a country of several hundred million, an armed populace is a defense against a tyrannical minority, not a committed majority. If a passionate majority wants something, it will happen, come hell or high water. No constitution, no politician, no political safeguard will stop them. Does that defeat the historical argument for the right to bear arms? I actually think it strengthens it. One might be inclined to fear an armed citizenry, ever on the lookout for perceived tyranny, ever ready to strike against the government. Sounds like chaos and anarchy to me. But the reality of the situation is that an armed revolution truly is the last defense against tyranny, and it will only be invoked in an extreme circumstance. The internment of the Japanese should never have happened because the people of the United States and their elected representatives should never have allowed it to happen. But the right to bear arms could not save the Japanese. The Second Amendment is not, and should not be, the only defense of freedom. Rather, it is the last defense, one that is as dear as it should be rarely employed. ‘Gun owners like to cite the Rev. Martin Niemoller’s “First they came for the …” but when have guns prevented our government from coming for anyone? The first line of that oft-quoted piece is “First they came for the Communists, and I didn’t speak up, because I wasn’t a Communist.” When our government was coming for the Communists, few raised a gun to bar McCarthy & Co. from doing so. Have guns ever been used effectively to defend someone from a government-ordered abrogation of their rights? With the Waco stand-off, some gun owners massed on the Branch Davidians’ behalf, but only rhetorically. Even they preferred to exercise their First Amendment right to complain about the government, and their Fifteenth Amendment right to try (unsuccessfully) to vote the offending Administration out of office, instead of their Second Amendment right to maintain the security of a free state by taking up arms against a tyrannical government. Then again, there aren’t many Constitutional rights that have their purpose right there in the text. The Constitutional right to freedom of speech is not justified in the Constitution itself; it is simply said to exist. Despite the perceived unfairness, Reynolds mentions rebels in Chechnya and Chiapas, and the native populations of Vietnam, Afghanistan and Somalia as having forced out modern armies of the United States and Soviet Union. A war in a foreign land is one thing; a revolution in one’s own land is another. The U.S. and U.S.S.R. governments were reluctant to “lose” Vietnam and Afghanistan, but the loss did not directly threaten the governments’ very existence. In the improbable circumstance of war between the gun-owning citizenry and the U.S. military, I would be surprised if our government constrained itself to ground combat, instead of launching SCUD missiles at the most problematic regions of the country. A government that has abandoned its sense of decency so far as to make war on its own citizens – even before that, to create a situation in which violence is the only way for citizens to regain control over their rulers — is unlikely to worry about the P.R. problems caused by using every weapon in its arsenal to crush the unrest. It’s also why I don’t find Timbuktu a very instructive example for the citizens of any developed country. The town was not being tyrannized over by the state; it was taken over by rebels against the state. The state being Mali, its security apparatus was incompetent to remove the rebels, and so Timbuktu was left to the rebels’ depredations until the French showed up. The rebels, in turn, were so pathetic that they could be routed quickly by the French military, which may not get much respect but does have the modern conveniences of tanks and an air force that the rebels lacked. In that sense, the easy defeat of the rebels — at least temporarily — is illustrative of how *little* even people armed to the teeth with guns can do against any 21st century military. I don’t think the problem for most of Africa is a lack of arms, but instead an excess of them in the hands of people who aren’t *sufficiently* under a state’s control.